This is a short blog post on the shortest period of expectant exuberance I’ve ever experienced. Y’all know I’m looking for a wider audience for my novel, Spy Act. I’ve sent it to various agents and contests and had some response but the Big Break, no, not yet. I’ve been “long-listed” a couple of times in contests – that’s the step before the “short list”, which of course is the step before the winner – but never made it up the ladder. I immediately went online to the website where I had submitted my novel. There I was. No word from the sponsors, at least none I could see at the moment (I later found it – dated Tuesday as well – in my Spam folder). 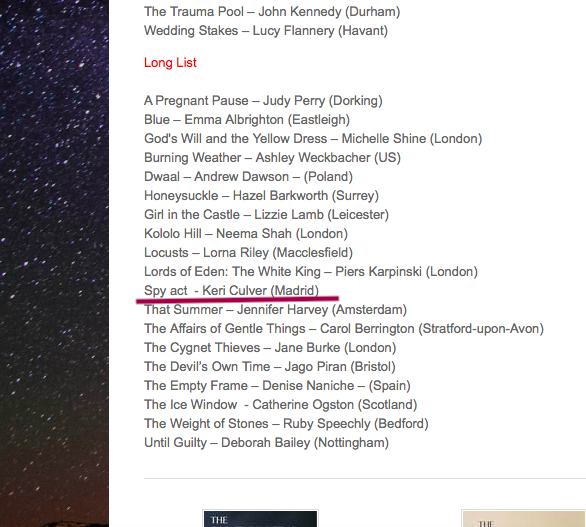 But just above the long-list, I found the short-list as well. Not… there. All in all it was about four minutes from shooting out of a cannon to dropping clumsily back to earth.